In this conference we offer both, our standard MTCC Compliance Certification Course and our Advanced Course. 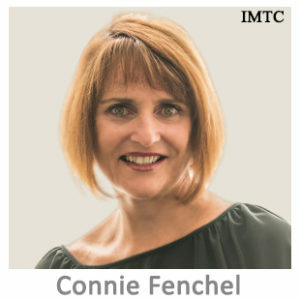 Both Courses have been developed for IMTC by Connie Fenchel, subject matter expert, consultant and trainer with a distinguished career in Law Enforcement, Regulatory Agencies and in the Private Sector. The courses are full of practical information, unparalleled guidance and important insights on best practices and expectation of supervisory entities worldwide. Your Course Registration includes a one day intensive and highly practical Course with a morning coffee break, Lunch, afternoon coffee break, admission to the Trade Fair in the afternoon, and an invitation to the Welcome Reception at the end of the day. The course will be in English with Spanish translation (only at IMTC WORLD). Upon completion of the course and the successful passing of an online test, participants will be awarded a Certificate and their names will be displayed in our Certified Money Transfer Compliance Specialists page. Build important technical skills and strategies to manage requirements while enhancing the technical skills and awareness necessary to handle the challenges that BSA/AML/CTF/Fraud compliance presents internationally to Non-Bank Financial/Payment Institutions and Money Transfer Businesses. Your Advanced Course Registration includes a full day intensive course where instructors will be discussing in depth particular compliance and regulatory subjects that need special attention as well as the discussion of cases whose significance make them extremely important for any financial institution, any place in the world. Participation is encouraged and ample time will be devoted to attendees questions and concerns. Attend this highly practical Advanced Money Transmitter Compliance Certification Course to obtain the knowledge required to take your practice to a whole new level. 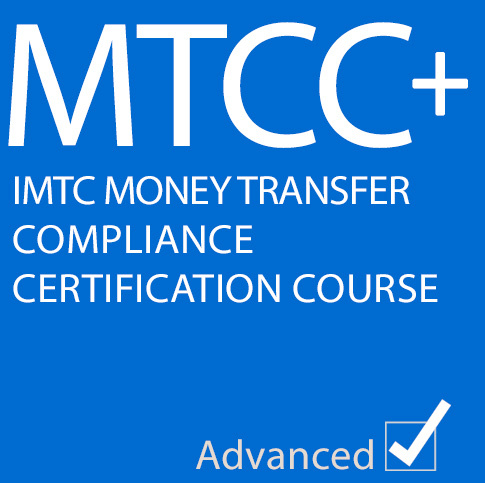 Upon completion of the course and the successful passing of an online test, participants will be awarded a Certificate and their names will be displayed in our Certified Money Transfer Compliance Specialists page. Are you interested in getting a strong grip in what constitute a top-notch compliance practice for a Money Transfer/Money Transmitter & Payments Company? Are you confident you can implement, participate in or maintain an effective company wide compliance program? The course will be in English (translation into Spanish is available at IMTC WORLD only. Upon completion of the course and the successful passing of an online test, participants will be awarded the MTCC Certificate. 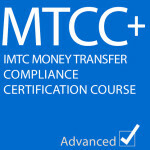 All the names of registrants that have been certified for the MTCC and MTCC+ appear in our Certified Money Transfer Compliance Specialists page. To be eligible, registrants must have a basic understanding of compliance to to get a better return on their investment. Each registrant must pass an online examination consisting of multiple choice questions and achieve a passing score of 80%. Be employed as a compliance officer or in a compliance department. Each registrant must pass an online examination consisting of multiple choice and essay questions and achieve a passing score of 85%. These prices are in US Dollars. You can pay online using a credit card or pay with a US check, an International Wire Transfer (in USD to our US Bank Account, in Euros to our European Euro Account). We are accepting Bitcoin Payments too. You can register to the Conference only, attend one of our Pre-Conference Certification Courses or both a Course and the Conference at a discounted price. Dear Connie: I want to take this opportunity and thank you again. I was honored to meet you with your extend of knowledge ,practicality and personality that was clearly one step over the rest of the crowd. I learned a lot in your compliance course and I thought you did an awesome job as a moderator. You were direct and honest and I really appreciated that. I gained more out of your course and hearing you speak than I had previously thought before attending IMTC. Thank you!